love reading today! love writing today! 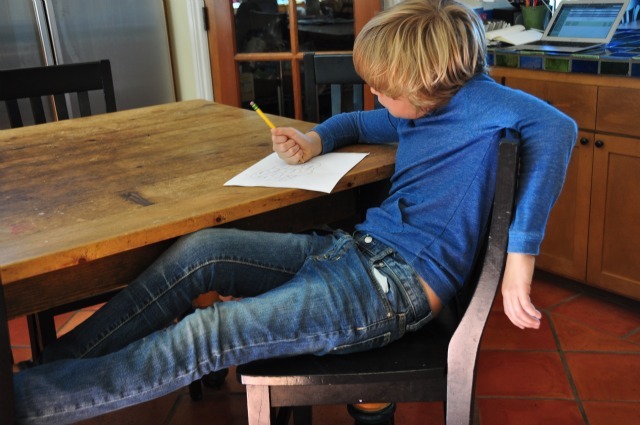 What would a teacher say about that writing posture? That pencil grip? Smart woman, that Amy. Rap him over the knuckles with phonics. Ha! I always appreciate her play with words. Writing a response to Amy, I thought about a post I wrote over a year ago, and the absolutely terrific feedback I received in the comments. In the post I asked parents to share their hopes for their kids and writing, and so many readers wrote back, generously holding their hearts open for me. Their words are definitely worth a read. Over and over again, parents mentioned some variation on the hope that their kids would enjoy writing, that they’d find value in it, and be motivated to do it. Our focus gets locked on these little steps, and what our child ought to be doing, and suddenly learning to read and write becomes a chore. We lose sight of the bigger picture. If we want our kids to love reading and writing in the future, we have to help them love reading and writing today. So how do you get them to love reading and writing today? This is where a little outside-the-box thinking comes in, and a little paying attention to your child. In the time you save not pushing phonics programs and grammar worksheets, you can be thinking about your singular, amazing child, and how to make reading and writing exciting in that child’s life. Today. Loving reading today may not involve your child reading on his or her own at all. Loving reading today may mean listening to Magic Treehouse audiobooks, as Amy mentions. Loving reading today may mean scooping up easy readers from the library on your child’s favorite topics (who knew there were so many ballet and puppy-inspired books for young readers? ), leaving them lying around, and then not nagging your child when she doesn’t pick them up. Loving reading today may mean coming home from the grocery store and sitting in the car in the garage, listening to just a little more of The Great Brain audiobook with your kids, because the story is too good to turn off simply because you’ve arrived home. Loving writing today may mean noticing that your son is writing online messages to the friends with whom he plays Lego Universe, and letting that be writing enough. It might mean encouraging letter and email-writing to friends, as my Indian blog-friend Rashmie does, or letting your son dictate a chart of Lego Ninjago characters like Carrie did with her son, and shared in the comments of my last post. Loving writing today might simply be the casual chat you and your son have about the crafty chapter titles Rick Riordan uses in the Percy Jackson series. It might involve no actual writing at all. All of these small acts allow a child, un-pressured, to learn to respect and enjoy reading and writing. If they keep having meaningful, enjoyable experiences like these, they will, eventually, want to read and write themselves. Here’s another way to put it. I always tell nervous parents of young kids something like this this: Your child will eventually find something that he’s dying to read. It might be a Magic card, or it might be a book about horses. And I promise, I really promise, your child will not want you taking dictation from her when she’s a teenager on Facebook. She’ll learn to write. They will learn to read and write because they want to. This doesn’t mean that they’ll learn to read or write when you want them to. And that, of course, is the fly in the ointment. This all makes sense in theory, right? Yet, it took me about ten years and three kids to really grasp the notion. I know I’ve written about this before (can’t find where) but I really pushed the school timetable on my oldest when it came to writing. I couldn’t shake what I’d done as a teacher, just a few years before. I expected him to do all of his own writing by the time he was six or seven, and I encouraged (read: required) him to write in different formats: nonfiction, persuasive, journalistic. I even expected him to recopy drafts when he was seven for no real reason other than that I expected it. Oh, I thought I was giving him a lot of freedom, letting him choose his own topics within my categories, letting him write silly stuff if he wanted to. Wasn’t enough. One day when he was seven, he swept a stack of papers off of the kitchen table in a rage, screamed, “I hate writing!” and stomped out of the room. I was lucky with him. 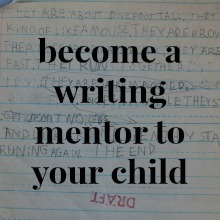 Writing and reading actually came fairly easily for H, and starting up a writer’s workshop for homeschoolers a few months later was all it took to make writing worthwhile to him, and to make him embrace it. By the time it came to Lulu, I decided I’d do anything to keep her from hating writing. So I started taking dictation from her. (There’s a whole series of posts on the topic, if you’re new here.) Thing is, I always felt a little guilty about it, like she really ought to be writing herself. Still, it worked, and Lulu has always fancied herself a writer. Mr. T is six years younger than his sister, and almost ten years younger than his brother. I started taking dictation from him when he was three or four, and began to recognize that not only were we having a fine time together, but T was learning an awful lot about writing, without writing a word himself. 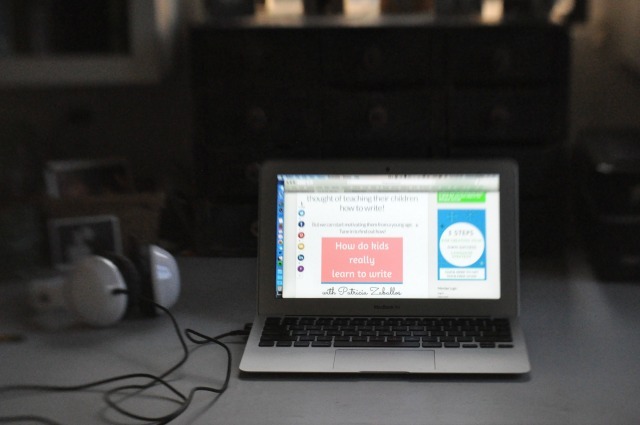 There are many posts on this, both in the dictation project series, and the writing with kids series. The bottom line is this: I never felt guilty that T wasn’t learning to write according to the public school timetable. Instead, I could recognize that I was raising a kid who loved having me put his words on the page, and who loved to talk about writing–both his own and the work of professional writers. Guess what? At almost-ten, he often chooses to write on his own. But more often he chooses to have me write for him. What matters more to me is that regardless of who’s transcribing the letters, the kid values writing. He thinks it’s worthwhile and enjoyable. And that’s all he really needs to keep going. There’s something about that first kid: it’s hard to keep your focus on today; there’s so much concern about where they’re headed, and whether you’re doing what you need to do to get them there. But once you’ve been through it before, it’s easier to trust in the process, and to enjoy what’s happening now. If you aren’t in the privileged place of having helped a child become a reader or a writer, I hope you can draw some faith from my story, and from the stories of other experienced parents, who never fail to kindly show up in the comments. It will work out. In the meanwhile, have some fun with reading and writing today. Don’t know what I mean by fun? Let your kid help you figure that out! I only write posts on encouraging children because I figured out the hard way that going with their interests works. Did you notice the part in my post in which this mother-who-loves-to-write caused her kid to emphatically hate writing? We’ve had many days of Kicking And Screaming-style Homeschooling in these parts. Took me a long time to figure out that it’s not worth it. I’ve been doing this for fifteen years, ya know? When my park day mamas and I sit around, we rarely talk about our homeschool high-points. It’s always the Wrath of God stories–much more entertaining! I’d only meet you for coffee if we could dish! A hard-hitting post, Patricia – in that it really made me think long and deep about if there’s anything I’m doing to ever make my kid hate writing. Gosh! I would never want to. But, who knows…! Who knows – in my well-meaning and intentioned parenting, if I may be doing anything to even trigger that. One thing though I am very sure of is – it has to be driven by her interest rather than my goal/expectation for her. Having said this, it’s hard – really hard – to not get into the “timetable” mode. But, what the heck. If all that the timetable does is make the child ‘comply’, what’s the real use? Oh, Rashmie, I highly doubt that you’re doing anything to make Pari hate writing. Based on what I read on your blog, she seems highly motivated to do what you do together! I just want to make the point that we should pay attention to when our kids drag their feet about doing something. (Or scream, “I hate writing!” at us!) If they don’t want to do something, we might want to ask ourselves why they don’t want to do it, and what the cost is in pushing them. Which isn’t to say we shouldn’t nudge our kids–I nudge constantly! But if there’s a way to make reading and writing (and other learning) more enjoyable for them, we should seriously consider those options. Enjoyment is a powerful motivator in learning, as you know! Your photo of T’s casual repose while he’s writing says it all. Obviously he’s not uptight about doing it, completely the opposite, probably because he’s writing something he wants to write about. If you had given him an “assignment,” we’d probably be viewing a different attitude. I think it’s our attitude and our child’s attitude towards writing that we need to remain positive at all times, future, past and present. We can shape our kid’s attitude by helping them recognize that their viewpoint is unequivocally unique and worth sharing. I have reinterated and continue to reinforce “the value of sharing ideas” with our three kids. Even when I listen to them describe something they’ve seen or heard, I sometimes mention that what they’re saying, their idea, is worthy of sharing in writing. Later, when our two boys were given assignments in school, I reminded them, that the whole point and the fun of writing an essay is to share a unique viewpoint. Focusing on their “perspective” being the point of writing helps them to make the transition to writing more prescribed things. The question is: how can kids in school who are being given exact criteria to include in their writing learn to find their voice and to enjoy writing? The whole system for teaching it is formulated and mind-numbing and that’s why I appreciated your statement to recognize the small acts that they’re doing that involve writing. Well, it’s taken me a long time to write this because our puppy is tugging at my bathrobe for breakfast, for play, for holding, but I wanted to share my perspective in writing. Thanks for your thoughtfully written post! I totally agree with you about the value of sharing ideas in writing. That’s what makes writing meaningful. It’s tough when that’s what they’re getting in school, isn’t it? 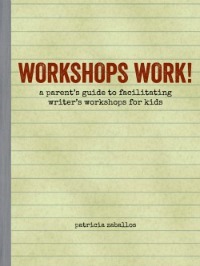 I tried to address that notion a few posts back with The Writing They Do On their Own Is Real Writing http://patriciazaballos.com/2011/09/07/the-writing-kids-do-on-their-own-is-real-writing/ and How to Encourage Writing with the Media that Kids Love http://patriciazaballos.com/2011/09/20/how-to-encourage-writing-with-media-kids-love/ In those posts I wrote about how kids can develop a writing voice even as they post Facebook updates. And if kids begin writing on topics of interest, whether that be via blogging, responding on forums, online reviews, etc., all the better. Have fun with that puppy! Will miss you today. We did! This morning H (4) dictated me a loooooong story- a play-by-play description of the Lego game he was having. Exciting stuff. Excellent stuff, wanderingsue! It’s great to get kids on board with dictation when they’re young, if they’re willing. Writing can grow quite naturally from there. Good to hear that a 4-year-old is developing such eloquent opinions on literature. There’s no stopping him now!